Wilma A. Mitchell passed away peacefully in her sleep Sunday morning Jan 13, 2019 in Norman, Oklahoma at the age of 96. Wilma was born in Walters, OK on June 26, 1922 to Robert and Dora Attebery, she was the 2nd child of 8 children. Wilma grew up in the country of Southwest Oklahoma in the Walters and Waurika area, as her parents farmed and picked cotton. Wilma was very close to all her family and kept track of everyone. She attended high school in Walters, OK. She married the love of her life Nolan L. Mitchell on October 14, 1939. They were married for 54 years before Nolans death in 1994. Nolan and Wilma welcomed their first baby, Janice Kay in July of 1940. Sadly, their baby died of SIDS on Dec 31,1940. Wilma quietly grieved the loss of her baby, her entire life. Two more daughters were born to Nolan and Wilma, Janet Sue in Dec 1943 and Donna Jo in April 1947. Nolan and Wilma were a military family and Nolan served in the Army during WWII. They traveled throughout the United States and lived in Japan. Nolan and Wilma retired from Cupertino, California in 1975 and moved back to their roots in Oklahoma. They purchased a home in Camargo, OK, and lived there until Nolans death in 1994. Wilma briefly lived in Woodward from 1994 to 1996. In 1996, Wilma moved to Norman to live closer to her granddaughter Lisa. Wilma loved her church, her faith, her family, working on genealogy, sewing, reading, preparing for family reunions. Wilma and her cousin Voncille worked for 8 years on a treasured family heirloom genealogy book The Descendants of William Atterbery. She spent many hours traveling, researching public records, hiking though cemeteries, and looking through microfiche. This book was one of Wilmas greatest achievements. Wilma loved her children, grandchildren, great grandchildren, nieces and nephews. She made many memories for her family of vacationing, road tripping, and camping. She could set up and tear down a campsite faster than a raccoon! Wilma and her sisters knew how to organize a camping trip and made sure all the kids had fun. Wilma had a deep love for her Lord. 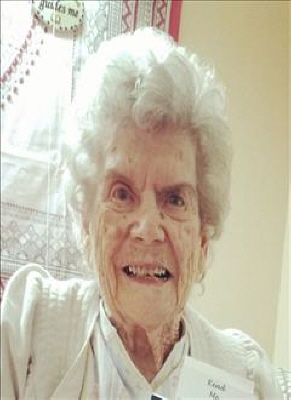 She was a member of the First Baptist Church and attended regularly, until her health did not allow her to go any more. Her deep faith sustained her through tremendous adversity. She always sacrificed to make sure her grandchildren were taken care of and educated. She read her Bible everyday and was well versed in the scriptures. Her deep faith sustained her through hard times. It taught her to be faithful, hopeful and to always be satisfied with what she had. She never lived beyond her means. She was a very frugal and thrifty shopper and never missed a good sale at SEARS! Wilma was preceded in death by her parents, her husband, her daughters Janice Kay in 1940, Donna Jo Mitchell in 2002 and Janet Mitchell DeRee in 2012, her granddaughter Sarah Jayne Reynaud 1997, and great grandson Matthew Means in 2008. She was also preceded in death by her brothers Carl, Robert and Lyndal Attebery, and sisters Merle Jean, Joyce Attebery Crow and Myrna Attebery Barry . Wilma is survived by her sister: Wanda Attebery Chase, Woodward, four grandchildren: Lisa (Scott)Pittman of Norman, Michelle Moritz of Virginia Beach, Virginia, Stephany Dotson of Crescent, OK, and Clint (Amber) Bragg of Phoenix, Arizona. Eleven great grandchildren: Tyler and Micah McCoy of Norman, Kendall and Morgan Bragg of Phoenix , AZ, Ty and Jude Moritz of Virgina, Christopher, TreVaughn, Acacia, Annicia and Arissa Dotson of Crescent, OK. She is survived by 2 great great grandchildren, Baylee Means McGregor of Norman and Cole Dotson of Crescent, OK .
Wilma had many wonderful qualities, she was a very honest person, loyal , faithful, a devoted wife and sister, caring grandmother. She excelled in research, genealogy, family history, eradicating Lisas laundry, doing the (Microwave Shuffle) every morning at 7 am for 7 years straight, baking cookies, fudge and divinity, walking daily, secretly giving the spoiled dogs treats even when we told her not to, watching OETA, Johnny Carson, David Letterman, Saturday Night Live, Archie Bunker, The Mary Tyler Moore Show, Lawrence Welk, and The Carol Burnett show. Grandmother, I am so glad we had this time together, to have a cry and a laugh or two. You will be deeply and sadly missed, for the rest of my living days. I will never forget the unconditional love you showed me, the grace you showed me, and the strength you showed me. I love you. Funeral services will be held at 2:00 p.m. Thursday, January 17, 2019 in the Billings Funeral Home Chapel with Reverend Tony Barros officiating. Burial will follow in the Elmwood Cemetery. To send flowers or a remembrance gift to the family of Wilma Mitchell, please visit our Tribute Store. "Email Address" would like to share the life celebration of Wilma Mitchell. Click on the "link" to go to share a favorite memory or leave a condolence message for the family.